Since Snow Leopard, each new release of Mail.app (recently updated with 10.6.5 and now 10.6.7) and the Message.framework it depends on changes a ‘plugin compatibility’ UUID and suddenly breaks any plugins or extensions you have enabled in Mail.app. The developers of each extension have to update each and every one manually, and can’t do so before the new software from Apple is released. If you can’t (be bothered to) wait for the updates from your plugin developers to arrive, however, and are confident that the plugin will work with the new version, you can hack said plugins and force them to be re-enabled inside Mail.app using the following method. Here I’ll be working with GrowlMail 1.1.2, but this should work for most Mail.app plugins. A word of warning — not only does this involve editing the plugin’s files, which if you get it wrong could break that plugin and force you to download and install it again, it is possible that your plugin really isn’t compatible with the new version of Mail, in which case it could cause more serious problems. Back stuff up before trying this — you should be doing so anyway. Once you’ve found the bundle you want to re-enable with the new version of Mail, open it (you may need to right-click and choose Show Package Contents). Here, that is GrowlMail.bundle. 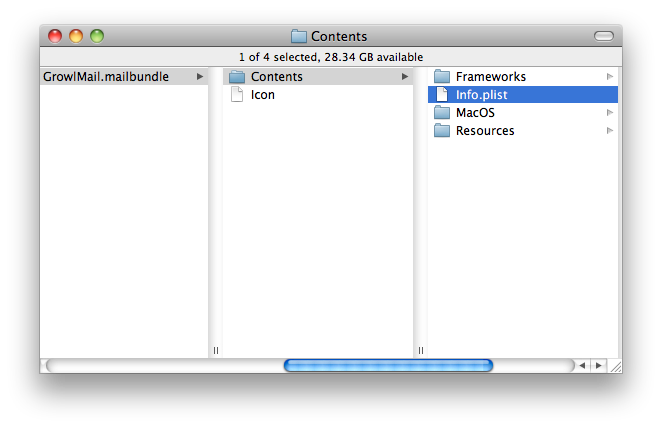 Inside the Contents folder, you should find Info.plist. 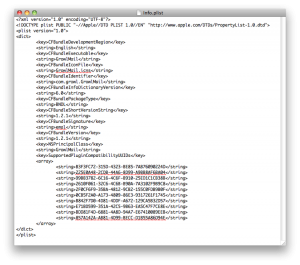 Open this in TextEdit. Once that is in place, save the Info.plist file and move the whole .mailbundle into Bundles, if it was in the Bundles (Disabled) folder before. Quit and relaunch Mail, and your plugin should load. This post was written by Peter on Thursday, November 11, 2010 at 09:04. 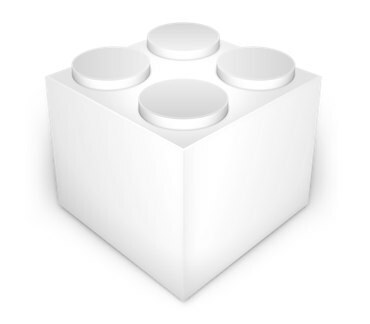 Filed under Mac, Tutorials.